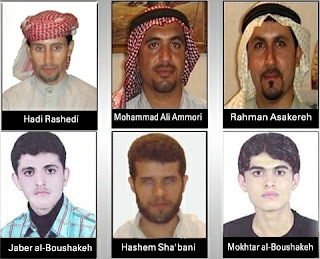 Reports from the region of Arabistan (Ahwaz) confirm that the Iranian authorities have recently issued death sentences against 5 Ahwazi Arabs and prison sentences against 3 others on charges of “threatening national security” and “Enmity against God”. This comes after the execution of four Ahwzi Political activists last month on similar charges. Mohammad Ali Amoori, 33 years of age, civil engineer, a student activist and founder of the Arab students’ publication “Turath”(Culture) in the city of Isfahan. He was extradited to Iran by the Iraqi authorities in 2011 despite having been officially recognised as a refugee by UNHCR in Iraq. Hashem Shabani(Amoori), 31, married with one child, holding MA in languages and Arab literature, also a post graduate with a Masters degree in political science. Hadi Rashedi, 37, single, teacher with a Masters degree in chemistry. Sayed Jaber Alboushoukeh, 27, civil rights activist. Sayed Mokhtar Alboushoukeh, civil rights activist. Rahman Asakereh, holds a Masters in sociology and is a chemistry teacher, sentenced to 20 years in prison in exile in a Mashhad prison or probably in a prison in the city of Yasooj in northern Iran. Ali Badri sentenced to 6 years in prison. Asmail Obeyat sentenced to 5 years in prison. According to reports from Ahwaz the Islamic revolutionary court, branch II in the city of Ahwaz, has already issued the verdicts but not made them public, probably waiting until the last minute before execution or for the sentences to be endorsed by the high court in Tehran. It has also been reported by Ahwazi activists that the security forces are planning in the coming days to transfer the prisoners to a secret location in solitary confinement in order to be executed in secret later. The Iranian authorities so far have presented no credible evidence against the men except for the state managed televised “confessions” on state-controlled television. It has been well documented that Islamic courts in Iran often accept these "confessions" extracted under duress and torture and use them as an evidence to convict the accused. In April 2005, Ahwaz was the scene of mass protests after reports that the Iranian government planned to disperse the Ahwazi Arab population in an effort to change the demographic fabric of the region in favour of non-Arabs and to erase its Arab identity. Since then, there have been several protests and riots, in commemoration of what has become known as the Nissan (April) uprising of 2005, resulting in many arrests and executions of Ahwazi activists, in several towns and cities. While the Ahwazi Human Rights Organisation (AHRO) condemns in the strongest terms these sentences and all other executions carried out by the Iranian regime against the Ahwazi Arabs and all other citizens of the peoples of Iran, it appeals to all humanitarian organisations and bodies in Iran and around the world to urge the Iranian authorities to immediately quash these sentences, halt all executions and release political prisoners in accordance with the universal human rights and international protocols and conventions.